Measurements of water quality and quantity are required for effective planning and monitoring of water supplies for livestock. If water quality is poor, livestock may drink less than they need or, rarely, may stop drinking altogether. When animals drink less, they will eat less and lose condition and if they are lactating, their milk production will reduce or cease. Water quality for livestock in Western Australia is most affected by water salinity, and the presence of water contaminants such as blue-green algae, organic material, heavy metals and chemicals. Failure to provide proper and sufficient water for livestock not only affects production, it may be an animal welfare offence. Mangers must provide enough good quality water to meet the needs of the animal. Check water sources regularly to see if quantity or quality of water has changed. Access to water sources must be safe for animals. Muddy areas which surround the water supply may lead to livestock being bogged as they attempt to reach water. This is a relevant in rangeland production systems as it is in southern agriculture. Plan well ahead for withholding water during yarding as preparation for transport or stock husbandry practices. Codes of practice for withholding periods for water give some guidance on normal withholding times. Provide extra care for vulnerable animals such as lactating or young stock, or in extreme hot weather. Withholding water should not affect the animal’s health during or after the withholding period. Sample on a regular basis, and keep records for each dam or other water source. If water is being reticulated to troughs, take samples at the fill point of each trough. use the conversions in Table 2 below to convert electrical conductivity (EC) readings to total dissolved soilids (TDS) readings, then refer to Table 1 for salinity tolerance levels. More detail about sampling is below. We recommend that salinity of water for livestock is expressed in TDS units, which is the national standard for livestock tolerance of salinity. Water salinity is the sum of all the salt ions dissolved in water, including sodium, calcium, magnesium, chloride, sulphate and carbonate. Water salinity is generally the most important water quality limitation for livestock as they can refuse to drink excessively saline water leading to loss of production. Excessively saline water may cause salt poisoning in livestock. Salinity is measured as the sum of all of dissolved ions in the water, known as total dissolved solids (TDS) and has units of milligrams/litre (mg/L). Identifying the ionic composition of salts in water, and directly measuring TDS is a lengthy laboratory process. For animal welfare concerns, send water samples to an accredited laboratory for TDS gravimetric analysis. The salinity of water (TDS) due to presence of salts is strongly correlated with electrical conductivity. It is therefore more common and practical to measure conductivity, rather than TDS, and then covert the EC value to TDS (Table 3). The units of electrical conductivity (EC) used by DPIRD are milliSiemens per metre (mS/m). Tolerance to saline water varies between livestock species (see Table 1). Pregnant, lactating and younger classes of livestock are less tolerant than mature dry stock. For optimum production in these classes of livestock, water supplies should not exceed the salinity levels towards the lower limits of category B in Table 1. Livestock grazing green feed can tolerate salinity levels at the upper limit of each category compared with those grazing dry feed or salt bush or on a high salt diet: the high water content of green feed will dilute the salinity levels of the water supply. Based on industry advice, we recommend using the information in Table 2 for pigs. a Sheep on lush green feed may tolerate up to 13 000mg/L TDS without loss of condition or production. 1000–2999 Satisfactory for pigs. Mild diarrhoea may occur in pigs not adapted to it. May have slightly reduced feed intake. 3000–4999 Satisfactory for pigs. May cause temporary refusal of water and temporary diarrhoea. Likely to have reduced feed intake, and may have reduced health. 5000–6999 Loss of production and decline in animal health/condition expected. Livestock may tolerate these levels for short periods if introduced gradually. A direct measurement of TDS usually requires laboratory analysis. As TDS and electrical conductivity of the water are usually highly correlated, it is more common and practical to measure conductivity, rather than TDS. The commonly used units of electrical conductivity are milliSiemens per metre (mS/m). Other common units of conductivity are microSiemens per centimetre (mS/cm) and milliSiemens per centimetre (mS/cm), which is the same as deciSiemens per metre (dS/m). We recommend that you use Table 3 conversion factors for different EC salinity ranges, especially at EC readings above 2000mS/m. TDS estimated from EC readings should be written as TDSEC to distinguish the difference from TDS measured in a laboratory. Salinity of a water supply can change over time and between seasons. Salinity levels of dams, creeks, soaks and waterholes should be checked during summer as salinity often increases during summer due to evaporation. Salinity levels can be kept as low as possible by cleaning tanks before each summer and scrubbing and flushing water troughs frequently, even up to twice a week. Stream salinity can increase after the first rains as salts left on dry creek beds over summer are flushed downstream. Long-term increases in water salinity are usually associated with land clearing and rising watertables leading to more salt seeping into water supplies. Groundwater is usually more saline than surface water. While TDS and salinity provide a guide to water quality, the concentration of calcium, magnesium, nitrate/nitrite and sulphate ions may also need monitoring especially if using groundwater as they can cause purgative or toxic effects. For example, while magnesium is essential in animal nutrition, it may cause scours and decreased production at high levels, so when TDS exceeds 3000mg/L, it may be advantageous to know the concentration of magnesium. Water testing for salinity is available in most regional towns, chemistry laboratories and from the department's Diagnostic Laboratory Services (DDLS) at South Perth. Livestock can be poisoned by drinking water contaminated with blue-green algae and their toxins. For more information refer to How to avoid poisoning of livestock by blue-green algae. Blue-green algae are a group of algae including Nodularia spumigena, Microcystis aeruginosa and Anabaena circinalis. They can produce spectacular blooms appearing like iridescent green paint or curdled greenish milk on water surfaces. Algae multiply rapidly (‘bloom’) in shallow, still warm water when the water is contaminated by plant nutrients, including organic and faecal matter and phosphorus. Water can become contaminated by birds, animal droppings, animal carcasses or run-off from bare paddocks, intensive livestock industries or sewerage waste. This can result in low production, disease or deaths in livestock. Botulism and salmonellosis are two livestock diseases that may result from contamination of water with organic matter. For more information refer to Botulism in cattle and Salmonellosis of sheep. Mats of organic matter should be removed from water by skimming the surface within 48 hours of contamination to prevent the material sinking. Water polluted with organic material can be treated with chlorine, although chlorination does not kill all disease-causing bacteria and does not affect toxins already present in the water. Chlorination is not suitable for farm dams. Water can contain elements and compounds which, at elevated concentrations, can cause toxic effects or residue issues. Heavy metals, such as arsenic, lead, mercury, selenium, zinc and the fluorides, and pesticides are of particular concern. Concentration of some heavy metals and pesticides is generally run-off, seepage or spillage from arable land and industrial or sewerage waste. If there is a high contamination risk or where productivity losses are suspected, you should get a detailed water analysis. Never use containers that have been used for herbicides, pesticides or fertilisers for carting water for stock. Deaths have occurred in livestock due to water contaminated with nitrogenous compounds from fertiliser containers. There is also a risk that livestock could accumulate chemical residues in their tissues which, if detected, could result in serious trade losses. Cloudy or muddy water can be a nuisance in water for domestic use and may block irrigation spray nozzles, but it rarely harms livestock. Large paddocks: When feed is dry and paddocks are large (greater than 100 hectares), two watering points or a moveable trough will allow better use of the entire paddock, reduce localised erosion risk and allow better animal performance. Warm water: Stock avoid warm water in hot weather, so deeper or shaded water sources will generally be preferred. Pipes carrying water above ground may deliver very hot undrinkable water to troughs. Lupin stubbles and weaner sheep: In summer and autumn, weaner sheep on lupin stubbles (and possibly other high protein diets) will not travel more than 500–600 metres from a water source. This increases the risks of soil erosion and lupinosis from grazing continuously around the water point. Large mobs on troughs: With large mobs of sheep (more than 600), the tail of the mob may not drink enough water before the sheep move away. The flow rate in troughs needs to be sufficient to keep water in the trough while all sheep drink. Allow at least one metre of trough per 130 sheep. Finding water, recognising troughs: Sheep not used to water troughs may take time to learn to drink from them. Young sheep are less adept at finding water so always push them onto water in a new paddock. 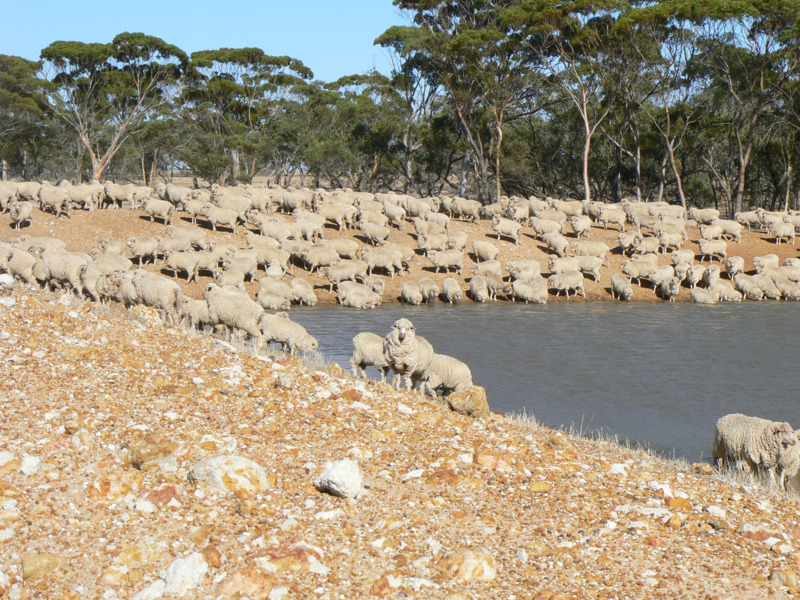 Dams versus troughs: Many producers observe that weaner sheep do better in summer-autumn on dams rather than troughs. This could be because of the previous two issues. Samples for water testing should be at least 500mL in a clear glass or plastic bottle, with the bottle and cap previously rinsed three times with the water to be sampled. Where possible collect samples of bore water directly from the outlet rather than from a holding tank, and after pumping for some time. The salinity of surface water varies considerably over the year but normally increases over the summer and autumn as evaporation concentrates the salts. Saline ‘pools‘ or layers can develop under these conditions. Water with higher salinity tends to sink to the bottom and mixes little with surface water. As water levels drop then the salinity of the water can increase greatly. A saline groundwater seep feeding into the bottom of a dam or creek could cause similar problems. For these reasons water quality should be measured on a regular basis. The water sample should be representative (not stagnant water from the edge). To measure water salinity from deeper levels, use a water bottle wired to the end of some PVC pipe: dip the upside-down bottle into the water and when at the desired level, turn the bottle upright so that it fills with water. By collecting samples at the surface and at lower levels you can determine present and future risk to livestock from excessive salinity. See Livestock water requirements and water budgeting for south-west Western Australia for detailed information. When livestock become ill or die, water quality may be the cause, but without an investigation, you cannot be certain. Contact your private or department veterinarian to investigate the problem. To find the contact details of your closest department veterinary officer, go to the Livestock biosecurity program contacts page.